BREAKING: Mummar Qaddafi has been indicted by the International Criminal Court at the Hague. For an idea of why read this eyewitness report that has recently emerged about the murder of an estimated 700 unarmed and peaceful demonstrators in Tripoli in the opening days of the uprising. Friends and family still don't know the fate of about 14,000 people state security disappeared from Misrata. After Tripoli falls, the state security records will be revealed and the full extent of Qaddafi's crimes will be a matter of public record. Then the complete bankruptcy of Qaddafi supporters such as ANSWER will be clear to one and all. ...person demonstration in support of Gaddafi that sources say occurred on either June 17 or June 20 and that ANSWER responder talked about? 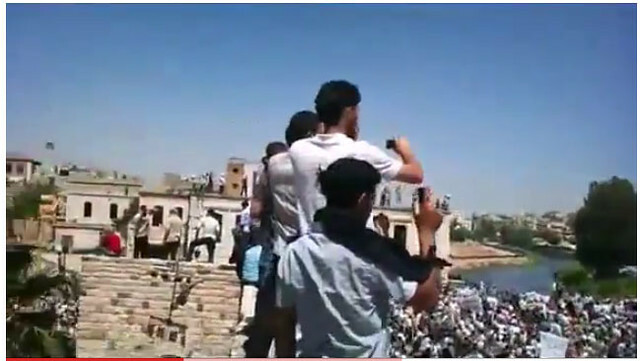 Surely, SOMEbody among the hundreds of thousands in Libya with cellphones took a photo of it. 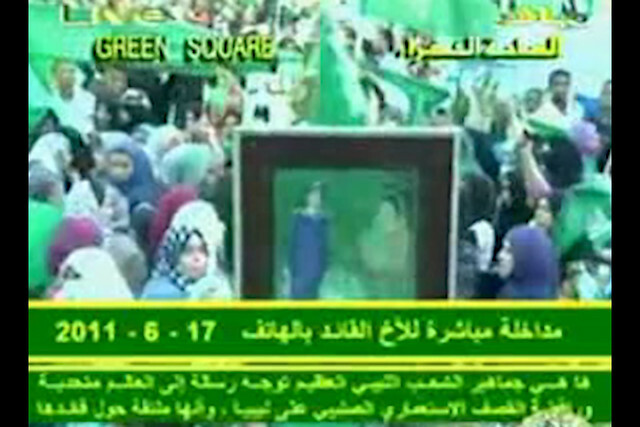 Surely the Gaddafi government would consider such a demonstration a propaganda coup. And yet not one single photo or even 15 seconds of video on the alleged demo. You'll never see a video of it because the Gaddafi Regime can't even muster more than a hundred paid protestors in Tripoli anymore. That bit of propaganda from the answer guy reminds me of the incident where Gaddafi Regime Libyan state tv showed footage from anti-austerity protests in London and stated that it was a demonstration against the U.N. intervention in Libya. The problem is that nobody is going to believe a quarter million people demonstrated in Libya unless they can see some video, even cell phone video, especially a pro-gov't rally. Not in this day and age. I've looked myself on YouTube and other sources but haven't been able find video of the protest you are talking about. This controversy is really a side issue. Can you help me put it to rest? You brought it up and you have all the details as to time and place. Can you send me a link to video of the protest of which you were speaking and I promise I will post it to my blog. 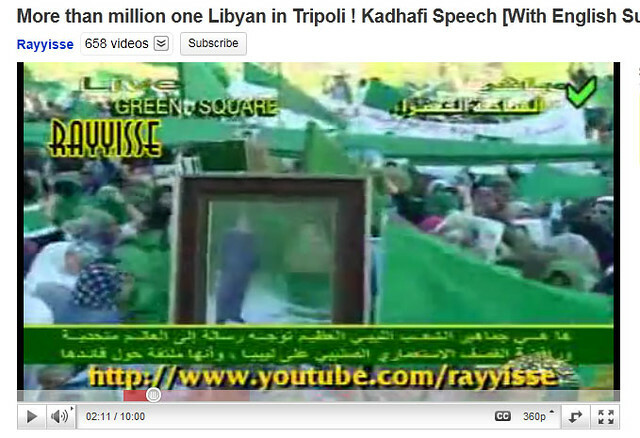 This is the youtube that is being shown: Mass pro-Gaddafi, anti Nato-Rebels Demonstration in Tripoli, June 17, 2011 and it does appear to be filmed from a cell phone. There was a report by Reuters but only the audio goes through as if the video footage had been censored out. The fact that the Reuters video is not functional leads me to suspect that it has been censored and disguised as a technical problem. A proof that Gaddafi, who for months has been described as having no support in the population is firmly in power and gathering a large rally in his support does not fit the US and NATO imperial powers story line for successful intervention and impending recolonization. Now, after spending this first beautiful Venice Summer Sunday hunkered down in front of my computer, I think Reuters got it just about right. 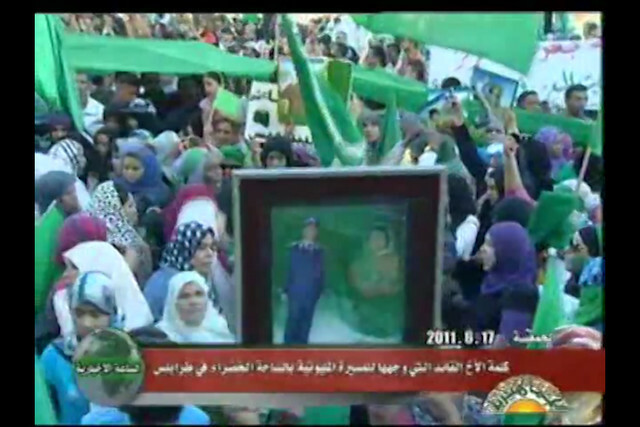 There was a pro-Qaddafi rally of several thousand supporters in Tripoli on Friday, June 17th. A sort of grid like structure to the crowd can be discerned, with men, many wearing white hats, often with arms folded form squares and corridors and the people are marching around in them. This is the first video he recommended to me. 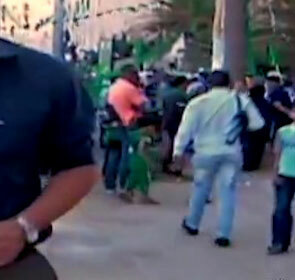 The one "that is being shown" by Qaddafi supporters that "does appear to be filmed from a cell phone." Well I could see right away that this was no cell phone video in spite of it having the generally low resolution and poor quality of a cell phone video. It was edited and from footage taken at different times from different angles, and it had captions. You can see that this image is of much better quality. 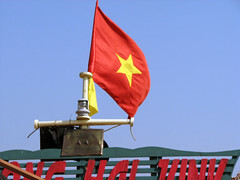 It is broadcast quality and it is clearly the source material for the above two videos. A peculiarity of all three of these videos is that the only audio that can be heard is Qaddafi's voice. Any sound track related to the video being shown has been completely omitted. We don't hear anything from the crowd and the actions in the video seem strangely disconnected from the audio. This effect would be impossible to achieve with a cell phone, in fact the biggest obstacle that someone with a cell phone or camcorder would face in trying to record Qaddafi's speech would be the roar of the crowd. Since it clearly has been professionally edited one has to wonder why the sound track of the people in the square was dropped entirely. This is not what most editors would have done. You want some crowd noise and especially crowd reaction to make it feel more, well more real. Why is it missing here? In David McKenize's reporting in the piece we can see a few seconds of the rare independent footage of this rally. In it we can see men with automatic weapons working the crowd. 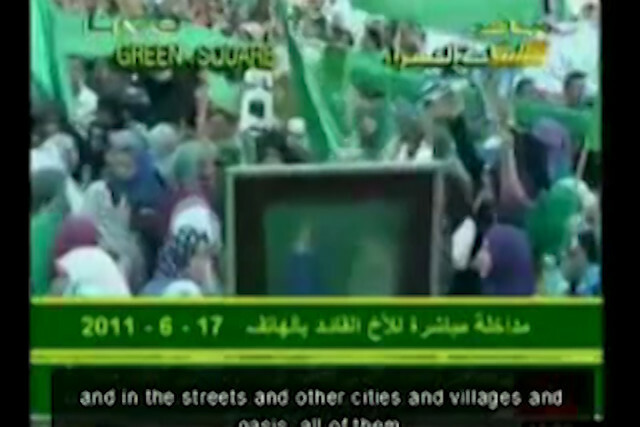 After that we are treated to more of the very same Libyan state TV footage. You would think that they would want CNN showing original footage they shot of the main rally, but no. 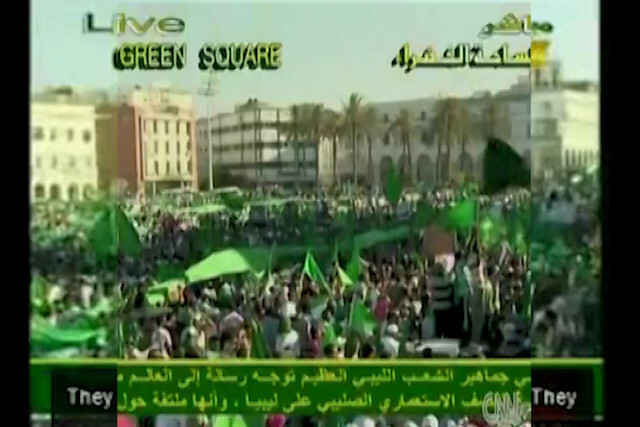 Here is a shot from the CNN broadcast laid over the same shot, but wider, from Libyan state TV. 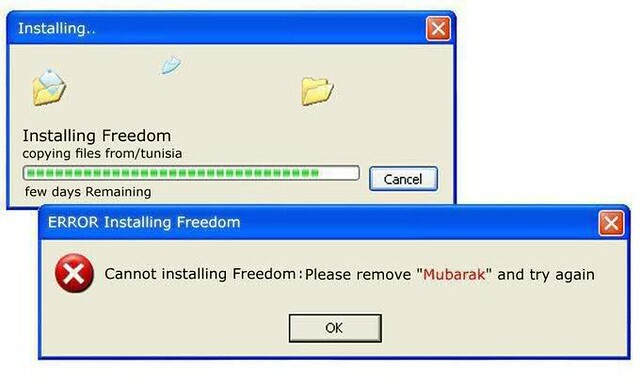 So it is claimed by Qaddafi and his supporters that a pro-Qaddafi rally took place in Tripoli on Friday, June 17th, 2011 and between 250,000 and 1 million people took part. This is a government supported and government sponsored rally and yet we can only seem to find one filming of it spun into many video productions. Why aren't there dozens or even hundreds of what really is cell phone videos available of this rally? So as you might expect, a cursory search of the web for cell phone videos of this rally turn up lots of unique videos that really do show something like tens of thousands of protesters. And this is under the conditions of extreme repression and very limited Internet access now existing in Syria.